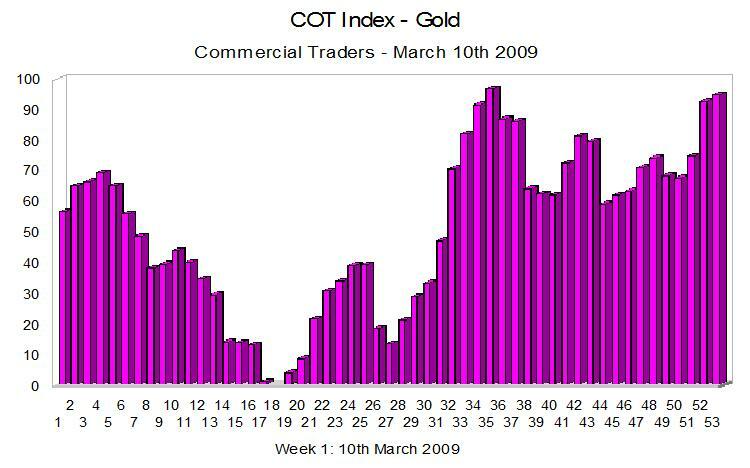 The weekly COT index chart for gold, shows little change on last week suggesting that the trend for spot gold prices is to move higher, with the commercials showing a slight decline as the spot price fell from $1000 per ounce to close the week around $920 per ounce. Despite the rally in equities last week, this is only seen as a temporary bear squeeze, and in the medium term I expect the markets to fall further, with gold providing the traditional role of safe haven status for investors. With many gold ETF funds holding greater reserves of gold than many central banks, the bullish momentum is likely to continue for some time to come, and until we see the COT index reaching highs of 90 or above, then it is a clear signal that the bullish tone of the markets is still in place. For the longer term therefore, spot gold contracts are a buy and hold strategy with wide stop losses to protect the positions on any pullback. The daily fundamental news is now available live on the economic calendar, along with live charts for the other major commodities including the spot silver price and the daily oil price.